Avelino Vieira scored three goals for Peterborough Sports. Peterborough Sports began their United Counties League Division One title challenge with a bang. The city side issued a deafening statement of intent by demolishing Irchester 9-0 in their PSL curtain-raiser yesterday (August 8). Prolific striker Avelino Vieira hit a debut hat-trick while midfield man Ollie Medwynter made a grand entrance of his own with two goals. Fellow summer recruits Jordan MacLeod, Josh Sanders and James Nespoli all found the net while Andy Boome, who was with the club last term, also joined the party. It is Sports’ biggest since they thumped Woodford on the final day of the 2013/14 season 16 months ago. 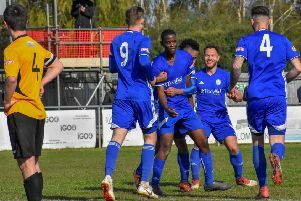 Fellow city side Peterborough Northern Star were left to count the cost of a missed penalty as they were forced to settle for an opening day draw in the Premier Division. Dan Bucciero blazed over from the spot midway through the second half of their stalemate at UCL newcomers Kirby Muxloe in Leicestershire. Star goalkeeper Dan George pulled off a couple of high-class saves in a game of few chances while the hosts also hit an upright from long range in the second period. Brett Whaley’s reign as Wisbech Town manager began with a 3-2 triumph over Newport Pagnell. Danny Beaumont made a goalscoring return after the rejoining the club on Friday and Stuart Cobb doubled their lead. Pagnell were level just after the hour, but Billy Smith’s long-range curler earned the Fenmen the points. Another new boss began his tenure with a draw. Deeping Rangers were held 1-1 by Sileby Rangers at the Haydon Whitham Stadium as Michael Goode settled into the hotseat. Scott Coupland fired them ahead from the spot on his debut midway through the first half, but the visitors levelled soon after the restart. There were losses for two teams touted as potential title challengers. A last-gasp penalty condemned Holbeach to a 1-0 defeat at Desborough while Yaxley crashed to a 3-0 loss at AFC Kempston Rovers. Bourne began their Division One campaign with a 3-0 success over Buckingham at the Abbey Lawns. Tyler Sculthorpe hit a brace for the Wakes with Joe Moore-Papworth grabbing their other goal. Reserve team assistant manager Jimmy McDonnell celebrated a clean sheet after being pressed into action between the sticks to solve a goalkeeping crisis. A late winner from Rhys Ford earned Phil Gadsby a first success as Blackstones manager. Ford struck in stoppage time as the Stamford outfit won 3-2 at Burton Park Wanderers. An Addie Staffieri double had earlier put them ahead after falling behind early on, but the hosts levelled with a quarter-of-an-hour remaining before Ford settled the issue.